Nuisance Wildlife Removal has built a reputation of honesty, reliability and highly effective nuisance wildlife control. Our critter experts are well versed in current state statutes and maintain the proper credentials, permits and licensing to handle nuisance Wildlife. Our integrated pest management & control is time tested, using specialized techniques and todays technology to resolve your wildlife conflicts.Our focus is on nuisance wildlife services, animal damage control & prevention and pest control so if you have a domestic dog, cat or a pet issue, please contact the Hillsborough County Humane Society. We are not a rescue or rehabilitation facility. Sick or injured pets and animals should be taken to a veterinarian or wildlife rehabilitator.We will remove problem wildlife from your home, garage, attic & crawl space. We will inspect, remove, relocate, clean out, exclude, repair and modify habitat as needed. Nuisance Wildlife Removal provides professional wildlife control for both residential & commercial customers in Bradenton Florida. We offer custom animal control solutions for almost any type of wildlife problem, whether it be the noises of squirrels running through the attic, a colony of bats living in a building, or the destructive behavior of a raccoon or other critter, we have the experience and the tools to quickly and professionally solve your problem. For a consultation, give us a call at 941-729-2103Not many Bradenton pest control companies are licensed and insured professionals, specializing in nuisance animal removal. Make sure that you hire a competent expert for your Tampa extermination of nuisance wildlife. At Nuisance Wildlife Removal, we will be courteous and friendly and take the time to answer your questions. Give our Tampa trappers at Nuisance Wildlife Removal a call, and we will listen to your problem, and make an appointment to perform an inspection. Florida is full of wildlife, including snakes, squirrels, raccoons, opossums, and more. You will need professional Bradenton snake removal or raccoon control if you can't trap the wild animal on your own and perform full repairs and prevention to keep pests out for good. We perform the repairs and decontamination if necessary. Rats and mice love to live in attics, and can chew wires or leave droppings. In fact Tampa wildlife frequently enter homes, and it takes a pest management company to remove them. We are Bradenton wildlife management experts, and are familiar with all the pest animals, including all species of Florida snakes and bats. We at Nuisance Wildlife Removal are the best among Bradenton nuisance wildlife companies and can solve all animal damage issues. Our wildlife operators are skilled at bird control and bat removal, and would be happy to serve your Bradenton bat control or pigeon and bird control needs with a professional solution. Opossums, skunks, moles, and other animals that can damage your lawn - we are the exterminators who can capture and remove them. 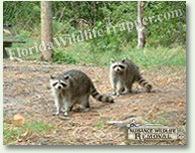 Our professional pest management of wildlife and animals can solve all of your Tampa animal control and capture needs. Give us a call at 941-729-2103 for a price quote and more information. The school Hillsborough school district's reaction? "Don't touch it," Hillsborough County School District spokeswoman Linda Cobbe said. "We're reminding students not to play with any wild animals." On Oct. 12, he sent a letter to parents to address the issue. "All of the construction behind the School is displacing native animals," he wrote. "We have noticed more snakes on school grounds and feel that it is important to emphasize that students should not attempt to touch them."